Why is 'ciao' so deceptive and sneaky? Why do sensible Italians cry so easily? Why are all Italian children interrogated at school for hours on end? Intrigued? Hopefully by the end of this post, you'll be able to feel pretty smug with your new collection of snippets which you can casually sprinkle into general conversation with your friends. While morbid means gruesome, gloomy or deadly in English, in Italian 'morbido' simply means soft or pliable. 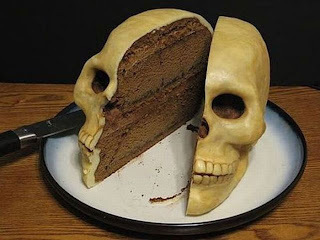 So a cake described as 'morbido' is likely to be soft, gooey and yummy rather than covered in sugared skulls or marzipan gravestones! 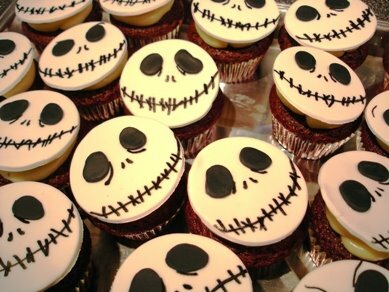 Or in a perfect world, a 'morbid cake' would look like these cupcakes - morbid and morbido! Here are some common examples of false friends in daily life. Everyday I hear at least one student say 'I need to cancel my answers' or a child asks me, 'teacher, shall I cancel the board?' I've become so used to this word being used that sometimes if I'm in a rush I momentarily forget and say, 'yes, cancel the board' before I correct myself. The problem here is that the English cancel and Italian cancellare both have the same meaning. They both mean to delete or to erase. The difficulty for Italians though is that English people don't just use 'cancel,' we also use three synonyms for specific situations. We use the verb 'erase' for removing information or pencil marks, we use 'rub out' for removing pen, pencil or chalk from surfaces and we use 'delete' in the context of removing information on a computer. But for Italians all of these concepts are encapsulated by the word 'cancellare' and so this complicates matters. While in English 'control' is associated with imposing power on something, the Italian 'controllare' means to check or to look over something. So when an Italian says, 'I must control my answers' they are just being conscientious and not power-hungry! But why is there such confusion with words ending in -are? The reason is that so many words in Italian can be easily transformed into English words if you simply remove the 'are' suffix. So if Italians find themselves in a pickle over a word, they'll often be sneaky and try their luck by removing the end of the word. I'm guilty of the same sneakiness in reverse as I usually just add 'are' to English verbs in the hope that they mean something in Italian. Either this trick results in a word that doesn't exist or you strike lucky and find the right word. More often than not though, it just creates complications and means that Italian and English words become confused or warped into a strange Italian-English hybrid which ends up confusing everyone. Onto the next common false friend pairing. This pair is an example of words which are very close to each other but at some point there was a slight shift in meaning by the time it reached the English language. A now onto one of my favourite pair because it amuses me every time I hear it. I remember being rather alarmed when an Italian child told me that she had been interrogated for an hour by her teacher. I became slightly concerned about the goings on of this school, especially as more and more children informed me that they were being interrogated on a regular basis! It turns out that in Italian interrogare can simply mean that you were asked questions, as in an oral exam for example. Whereas in English, the meaning of interrogate has been narrowed down in our collective mind to police detectives questioning and intimidating criminals. This pairing leads me on to problematic words, ones that have the same meaning in one specific context but in other contexts are completely different. A perfect example of this is a pair of words which are both basic and fundamental to both languages. The inclusion of these two might confuse you at first because even in English we use ciao to mean hello or hi (usually when we feel like sounding a bit continental). The problem lies in the fact that in Italian, 'ciao' can be used as 'hi' when you meet someone and as 'bye' when you leave. Italians are told very early on that 'hello' means 'ciao' (which has a double function that 'hello' doesn't). But this duel function concept is ingrained into Italian minds. This is all well and good when you exchange greetings at the beginning of a conversation but it does mean that I'll often have a student who waves to me at the end of a lesson and says 'hello!' rather than 'bye.' It's incredibly difficult at this moment to stop chuckling to myself and correct them, particularly as this mistake comes just as the student disappears though the door! Have you come across any false friends in Italian? Do you have an experiences with false friends in other languages you speak? Thanks! Glad you liked them : D Hope to hear from you again soon. Have a great day! haha.. i just knew that such things called false friends. here in indonesia, sometimes i confuse my native language to my friend's native language because we sometimes find similar words .sometimes they means the same things but sometimes they just false friends. hehe no problem (hopefully the problems on the website have gone away now). 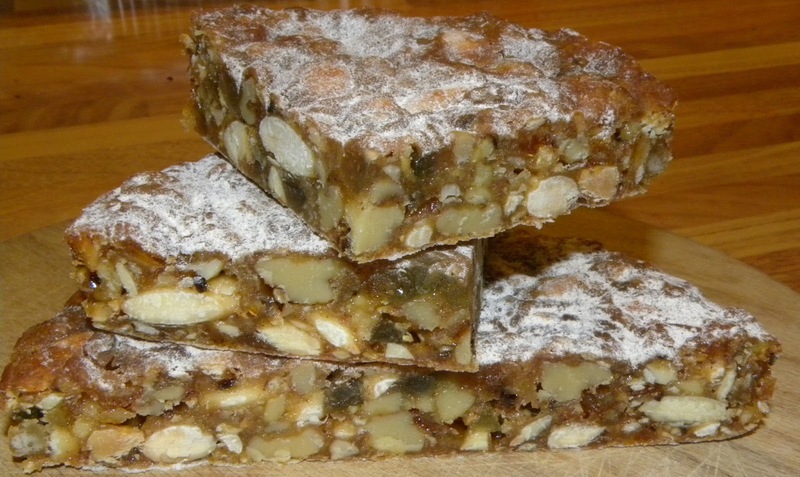 I liked your photo of the cakes so much, I've put them in anyway : D thank you so much! Your blog is really lovely so it deserves a mention. Hope you're having a lovely day. This is an informative and interesting post! wow your extremely creative! thanks for you visit and leading me here... going to be a new follower! Thanks for commenting on my blog - and it's so grreat to discover yours! I like oxymorons (Greek word, and fitting since I am in Greece teaching Engligh) ie: an honest politician. I have ss regularly say things such as "Miss, shall I put out the light?" You've got me thinking now - thanks Sarita. Hi! Those are so interesting - thanks! I'll try and remember those if I have any Spanish students. I have a friend who tried to say that she was embarrassed in Italian to her Spanish friend and said 'imbarazzata' but 'embarazada' in Spanish means pregnant!! She wondered why her friend looked so shocked! A lot of italians say that spanish is easy to understand but there is also a lot of confusion with false friends!! A brother I know wrote a short article (less than a page) on the proof of Islam, and wanted it to be translated into Italian. I have found it funny when saying English words to my Algerian family who speak a mix of French/Arabic. In English we say lets go to peepys (sleepy peepys meaning sleep) when its bedtime. However my family found it strange when I took my son (aged 3 at the time)to bed instead of the toilet! For them pee pee translates to urinating!. And when I said lets go for a wee wee (urinating in English) they look at me more strangely when I take him to the toilet - Wee wee translates as Yes Yes in French also the toy Noddy is pronounced wee wee (qui qui) in french! There are probably many more but them ones have always stood out for me lol! Love to learn new things! I might of learned that in school but I admit I had forgotten Thanks so much! Well-written! Thanks for the explanation!! muѕt ѕaу this blog loaԁs a lot fastеr then most. Cаn you suggеst a gooԁ internet hostіng prοvіdeг at a honeѕt ρrice? Thanκ you, I aρρгeciаte it! Thanks for both your comments. The difference between uses of pathetic is a great example. Bologna Cioccoshow: Reinventing the Kebab!